Whilst this blog was on hiatus I kept an eye on The Campaign for Real Books, intending to write a follow-up to my previous articles on ‘CAMBO’. Now I come to it, I find the presses silent, the campaigning has ceased. This was particularly surprising. When a publicity campaign hasn’t had any publicity for a year, things are probably not going well. It’s worth taking a moment to consider the campaign in retrospect to see what went wrong and what it says about our understanding of eBooks. The Campaign for Real Books was started in the same spirit as The Campaign for Real Ale – a successful movement to promote the production and consumption of traditionally brewed Ale. This bookish variant would involved advertising and collaborations with independent booksellers to ensure the survival of real books – what could be wrong with that? Everything. Wherever there’s debate on the merits of real books vs. eBooks there’s someone declaring that books are old-fashioned and have been superseded. Often they’re the tech’naive or digital-evangelist; newly converted, spreading the word with glazed-over eyes, glossy as Macbooks lids. Sometimes they’re cynical; unpublished authors with a grudge or embittered bloggers crusading against the mainstream media, getting their shots in where they can. Then there are those with good intentions. Those that want to extol the virtues of the humble book but damn it with faint praise. They love the smell and feel of ink on paper, the satisfaction of holding words in your hands – so delightful, so twee. They reinforce the idea that the book has become obsolete and we should preserve it as a kindness. Some will rally to the cause but the majority read such comments and assume the eBook is ascendant. The Campaign for Real Books fell into such a trap. To claim that real books are in danger, is to present them as weak. To equate them to real ales puts them firmly but falsely in the category of the niche, boutique good. In reality eBooks sales are but a fraction of all book sales and their growth is stalling, but to jump so vigorously to the defense of real books indirectly increases confidence and awareness of eBooks. What they should have been doing was exposing some of the outstanding issue regarding the current eBook scene and why we should have less confidence in them. To further illustrate their imminent extinction, The Campaign for Real Books compared Books to Vinyl records. It’s a prevailing trope: that books are analogous to the various out-dated media standards – after 600 years they have become Beta-Max. It’s nonsense. Books are more than a storage medium, they are the delivery device and the interface. They create the physicality of the word in such an intuitive way that eReaders attempt to replicate it as accurately as possible – with mixed results. Whilst they offer some benefits, eReaders are very much a sideways step. In contrast, The transition from records to tapes to CDs to MiniDiscs (or not) was progressive, it did not change the formula of how music was stored and played. One device and medium superseded the other with superior quality or capacity. Where one outmoded medium had an advantage – Vinyl’s acoustic warmth for example – it will survive. 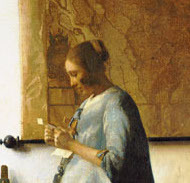 What characterises each of these transitions is that they were, in essence, natural. Record Companies, Electronics Manufacturers and Retailers would present the options and over time Consumers would make a choice as to what device was preeminent. Formats such as MiniDisc (and potentially Blu-Ray) could be rejected, it was not possible for a any particular faction to truly force a product onto the public. But times have changed. We have a situation now where Amazon controls the marketplace, the electronics and, to a large extent, the publishers. Furthermore they have proven that they are prepared to take large losses just to take market share. And this is what is driving the recent eBook push, one companies attempt to dominate a market to an unhealthy degree. Had Amazon not developed the Kindle and allowed Sony, Kobo et al. to produce the actual eReaders we would not have seen half as much eBook activity. The soi disant eBook explosion has been driven by one company’s desire to lock consumers into a walled garden and onto their proprietary device. There’s so much here for anyone campaigning on behalf of real books to get their teeth into. If Amazon had their way their stranglehold on the market would become a death-grip. Their DRM is restrictive and poorly understood. The concept of renting ones media as opposed to owning it has wide ranging implications (and not just for Bruce Willis). These are important and complex issues, ones that are obscured by the constant barrage of pro-eBook propaganda. 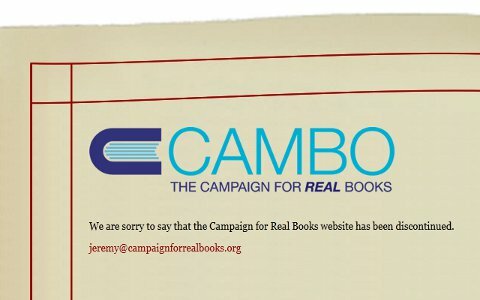 The last thing I saw from the Campaign for Real Books, aside from the defunct website, was a poster in which someone whose child is having a medical emergency needs to consult a help book but it runs out of power. Scaremongering, really? Opportunity missed. From Dumbledore’s death to news of a new Martin Amis novel, Literary history is full of saddening moments. Since someone asked, here are my top five saddest moments in literature. It might seem strange to start with an ancient martial epic but war, and the misery it entails, seems to be eternal. The Iliad describes a conflict that no one wanted and which people tried desperately to avoid. At unexpected moments the epic will contextualise events, puncturing bravado or creating sympathy, giving it a profoundly anti-war feel. Over 250 individual deaths are described, most in vivid and brutal detail. Not one warrior comes to a glorious end, all are dragged down to Hades, broken and cursing their fate. The poem is full of deceptively sad moments that only reveal themselves in retrospect. When Menelaos and Paris square up to fight, for example, they have an opportunity to settle the dispute before the war even begins. Both the Greeks and Trojans are willing Menelaos to win, they have laid down their armour and blurred their battle lines – recalling Christmas 1914. Of course Aphrodite whisks Paris away on a cloud and see the war for what it was, a torment visited upon man by the gods. When we first meet Pierre Bezhukov he is a pompous, gluttonous yet strangely likeable schlub. By the end of the novel he is a new and better man. Yet it is hard to rejoice in his transformation given the tremendous costs it entailed. Napoleon’s invasion, romantic chaos and, most importantly, the death of his friend, Andrew Bolkonsky, are all integral in Pierre’s growth. The sadness then, becomes all pervading, tragedy becomes woven into his character as we see that there can be no salvation without suffering. This is grand tragedy but King Lear also contains some of Shakespeare’s most intimate and tender moments. Lear’s descent from King to madman goes hand in hand with the unravelling of his relationship with Cordelia. That we’re invited to philosophise on how far Lear is responsible for his plight only highlights Cordelia’s raw, irrational loyalty towards him and makes their relationship all the more poignant. As seen above, the great Russian Novel has given us so many tragic men, women and moments, but the greatest, in my mind, is one of the more subtle, gentle endings. It is the demise of the arch nihilist Bazarov in Turgenev’s Fathers and Sons. The young doctor plans to practice medicine amongst the surfs and be of service to mankind whilst denying all authority and irrationality, which includes love. Naturally he falls for a charming widow and makes a bold declaration of his feelings. When he is rejected he retires away to sorrowfully fulfill his plan, catching Typhus from a patient. Unlike some of the entries here, Norwegian contains no cataclysmic events, nor any great ideological clashes. And whilst it has more than its fair share of tragic deaths, it is in fact the love-triangles of Murakami’s most popular and accessible novel that I’ve chosen as my saddest moment/event/thing in literature. The first triangle revolves around Naoko, her boyfriend Kizuki, who committed suicide aged 17 before the story begins, and Kizuki’s best friend, and our narrator, Toru Watanabe. Naturally the connection between Toru and Naoko is tainted at conception but it offers them a chance for salvation and meaning. The second involves Toru, Naoko and the boisterous Midori who offers Toru a different kind of salvation and a chance at happiness. What makes many of the other moments on the list so tragic or sad is that they could have been different: War could have been averted in the Iliad; things could have gone differently for Bazarov, all the ingredients were there. But here, as much as the reader might will Toru towards Midori, we cannot shift the idea of Naoko, like a burden you can’t put down. Murakami has constructed a web of relationships from which characters cannot escape. It’s an intractable situation and one that is unutterably sad.